This is the simple biography of a media-man who went from being the youngest newsreader on Australian Television, to the man who created more Radio Licenses than any other person in Australian History. He invented Narrowcast Broadcasting and is a person well known to the broadcasting Industry. Keith came from Newcastle, that well-spring of Talent on the East Coast of NSW, Australia. At Age 14 at Lambton (scene of flooding in June 2007) he was noted for his superior verbal reasoning and was shifted to classes for more advanced students. He then won the debating championships of NSW. This lead to his becoming the youngest Radio Announcer (Aged 14 years) in Australia. Youth was never a barrier and his early income came as well from Rock Dances at Tyrell Hall and Town Hall in Newcastle as he made his mark on Newy youth culture. Seeing his potential, Channel 3 (now NBN) made Keith the youngest Newsreader on Australian Television with him reading the 6 pm news in its early days. Television experience followed at Channel 8 Mt. Isa, ABC Television and Channel 8 Lismore. Approached by John Brennan of 2SM he was hired as the last "Good Guy" for 2SM Sydney. Adventure then beckoned and Keith went to work for Pirate Radio Station RADIO HAURAKI. According to Media People in New Zealand at the time his contributions helped change the future of NZ Broadcasting, bringing in the modern era and making possible the promotion of kiwi music and the promotion of many artists. David Gapes the founder of Hauraki writing a reference for his travels described him as a "gifted colorful broadcaster". The Pirate Radio ship Caroline gave Keith more adventure, before Abe Nathan signed him as a DJ on the Peace ship traveling to Israel, providing a Pop Music starved population with an alternative to Wagner being broadcast from Jordan with a very powerful Transmitter.
" he was bloody good at selling, I have never met anyone like him since. He could sell you the use of your own legs, and then arrange a tax if you walk on Sabbath...yep...they broke the mould with Keith". Returning to Australia Keith worked again for Color Radio in Brisbane. During this time he was given the ANZAC of the Year Award by the RSL in 1971 for his community service. On returning to his home town of Newcastle, he established the 'Z' Youth Station at 538 Hunter Street and was the first to promote Dance music on Radio. A small scale experiment which lead Keith to effectively invent Narrowcast Broadcasting, which now has 1,000 licenses countrywide and has given a voice to many. He entered into partnership with the Labor Council of NSW (2KY) which enabled him to establish the ZFM Radio Network. Up to his passing Keith was still a valued part of ZFM. He said " They gave us a paltry 1 Watt and a regulation regime which a restricted aerial height . Sure. We got commercials... A WIN, but we were restricted in carrying news . In the beginning only bridging music was allowed and a repeating 2 Hour Tape. But we tested Country, Dance, Ethnic, Christian, and school , We tested suburban with music and news but failed. In the beginning FANNS was our industry narrowcast association which I was an active member of. Since then we had had 2 other organizations and due to CBAA and CRA opposition nothing much had been achieved. Out of over a hundred licenses I got 64 on the air but as I supported the use it or lose it I divested these to other owners. So I was never greedy. When I decided to sell the ABA didn't even have a form to do it. 2MG transmitter. Max and the Boys at 2KY all helped and the mast at Homebush was the old 2EA Stick." Keith also realized the potential of the internet to reach an audience and began the MATILDA SEARCH ENGINE which attracted record traffic. MATILDA was later offered $14 million dollars for a direct buy-out. More recently Keith became officially blind (he describes it as "like seeing through a snow storm") due to complications from a life long battles with diabetes. Despite the setbacks, he became a member and advisor to 2NBC in Sydney gaining for them a , news feed and local news service. Keith retired at 63 to live in Fairfield in Sydney still managing the website Aussieseek.com and involving himself with new Radio and TV Station License Applications and doing what he had always done--creating opportunities for others and embracing new media ideas.
" That's the way I liked it..." He said " Its a sure shot for impact"
"You become very employable.. and that's not a downer"
should remember its a cool way to see the world"
Keith was inducted as a Life Member of IARBA on 1st July 2007. He died suddenly on Friday 21st June 2008. I met Keith in the middle nineties working at his new project “ZFM Dance Radio” in Newcastle—a 1 watt LPON that went on to grab a whopping 10 points from the local radio market in the next survey. Whilst this was the first time on air for many of the young presenters who owe Keith their start in broadcasting, as he and I had been at it on and off for a number of years (although Keith a lot longer than I!) Keith and I struck up an immediate friendship that came from a common love of radio. Keith had worked extensively in pirate radio, in which I had had a few youthful adventures as a teenager and this kept us talking for hours and hours. As we both came from a Geordie heritage we also found that we had a very similar sense of humor so we were often laughing whilst those around us looked somewhat puzzled! Whilst, as with any strong friendship (some common friends will recall that he and I had our ups and downs over the years!) Keith was the type of guy that the odd argument now and then only made your friendship stronger. Unlike so many people in the business, he didn’t hold grudges and he’d rather help you than hinder you. The years I spent working with Keith have been some the happiest times I have spent in the radio industry in Australia and I will sadly miss working with him and in particular his friendship. I have learned a lot from him; professional skills now generally not available to be learnt at any price in a rapidly changing media landscape. He came from an era of broadcasting where real personalities ruled the airwaves as radio was still king. The achievements of his life still stagger me, as they did the first day he showed me his tattered scrap book of memories after I’d asked many times—Keith would never brag of his achievements in radio, he was the true quiet achiever. Whilst I read daily of icons like John Laws, there have been no broadcasters quite like Keith. None who have had the diversity of experiences and the willingness to embrace and pioneer new forms of media. A passionate believer in free speech, Keith always believed that the media should be something with as much diversity and variety of ownership as possible. The last months of his life were spent tirelessly lobbying the government to open up DAB Radio to an increased number of operators. I will miss you Keith and the jokes we shared each day—I am expecting to hear mysterious music in the air soon because you have convinced god to let you open a new station in heaven. I lived with Keith until the end and you can say one thing. It Was Never Boring ! Fighting with the cat to keep it away from the bird was Keith’s favourite past time , finding the remote to the TV was always a challenge even though it was sitting right next to him or fighting off the dreaded viruses, replacing the mice and hard drives on his computers (he killed them with stunning regularity) but most of all I'll miss his understanding, steadfast and tangible friendship. I'll see you mate.................but not for a while. Both Drinks Keitha. I wanted to send in my own piece on Keith Ashton I Guess from a different perspective. You see Keith was my Uncle and he was a very wise man who would give the shirt off his back if it meant someone less fortunate needed it more than him. As a kid I was constantly in awe of all the many different ideas he had from newspapers to local radio stations….he always had big dreams. He was also the best riddle teller…I can remember one Easter searching for two whole days for $10 hidden in our house and guided by only Uncle Keith’s cryptic clues. I loved his wit his intellect and the way he was a fighter for the oppressed and vilified. Both he and I shared the gift of the gab so when Christmas at mum’s was on and we both made it we could talk Philosophy for hours. He always believed you could do anything if you put your mind to it. He will be missed especially by my mum Carole as he was her only living brother. There is a time for each of us and so sad that he had to leave so soon. I am indeed sorry to hear of Keith Ashton’ s passing. Keith and myself were responsible for Beach Radio in the early 70's at Newcastle Beaches, I haven't seen him for many years. He was great on NBN news till that ended which was when we were mates building Beach Radio. He was also a 2HD good guy till just before Beach Radio. Keith had a terrific voice and good script writing ability. 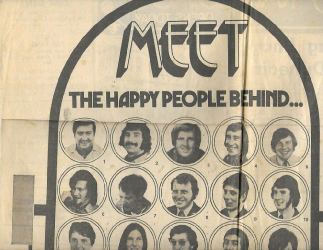 At the time I knew Keith when all these things were happening in the early 70's he was also selling and production writing advertisements for his sales at NBN television. I built the beach radio studio with gear from 2KO tech Mr Len Daley and chief engineer Mr Harold White. It was KO's old broadcasting gear from studio2. the CML building Hunter St Newcastle. Myself ,Steve Wakely and 4 other guys did the announcing while Keith sold the advertising. Keith was also running the top of town Tyrell Hall Dances with Mark Hall. At the same time Keith was producing a monthly rag for radio stations and had circulation to almost every station in Australia. He provided info about American station sales and broadcasting theory and radio gossip from all over Australia. Also providing on air job availability as well as promotional ideas and a fresh look at sales within the radio industry. Many announcers owed Keith for finding them ON AIR jobs when they were out of work. Keith said to me that station managers paid his subscription to find out what every other station manager was doing. It was a very successful news letter. I had built a small AM valve transmitter using a 12AX7 Twin triod valve and some old radio components and showed it to Keith who instantly named me the Top Jock of the Block. It had a range of about 500 Mtrs smack bang in the middle of the AM broadcast band. I drove him to the my front gates and switched on the car radio and told him to wait in the car . I went to the garage where I had built a modest studio which had a couple of turntables, a mixer ,an OB line from a radio receiver for news , mike on a boom and began to broadcast. Keith was immediately taken back when I burst on to the air over the top of 2KO and rushed in to find me behind the mic. He was elated and couldn't believe what I had done after showing him the hand held AM valve transmitter. It was from that moment that Beach Radio was born which was quite a long time before the narrowcast era. We used to drive around at night in Newcastle with a bucket of glue a huge paint brush and large advertising posters searching for prime telegraph pole advertising spots. At the end of the night Keith was covered in glue but Newcastle would know the following morning when the next Top of Town Tyrell Hall Dance was on and who was to play on the night. Keith was also at the time presenting news bulletins on NBN Channel 3, he was clean cut ,looked good on camera and had a terrific voice. I can still remember going to NBN with Keith for a late night news bulletin and standing next to the camera, what a thrill being in my first TV station and seeing the news being broadcast live. I will never forget that night so long ago Black and white in those days. I could write of many things of Keith Ashton and evoke many memories of him but to sum up on this occasion I would simply say that the only real enemy that Keith Ashton ever had ... was himself. Keith had a brilliant mind for future thinking, he was the only true IDEAS MAN I have ever come across. He was a man of fast thought ,assertiveness, over proactive, impulsive, forward thinking and futuristic, he never slowed down. While he was talking to you his mind was working elsewhere. Today, Keith may have been diagnosed with Bi Polar disorder, it does seem to come with greatness of mind. Just like to think that Keith Ashton is in heaven with all the best of them cueing the hits and playing the best causing commotion and mayhem for the big management. Keith , where ever you are ,I hope we meet again. 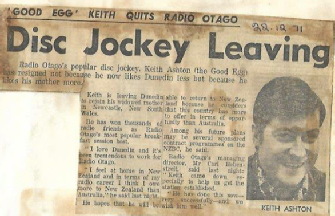 I worked with Keith at several Great radio stations, including 7HO (Gidday to Nick Weare I remember you well mate) in the late 60's , Then at 1ZH Hamilton new Zealand, Then at radio I Auckland to do the Radio revolution. I was always hired at first because we had similar styles. Keith was a truly Gifted Broadcaster, and inspired many up and coming Jocks in those Halcyon days. I was totally in awe of him. We did become great mates. I did a tribute to Keith on my show on Monday on New Zealand's Solid Gold Network and was inundated with calls from people who recalled the Good Egg as he called himself in those days. I was saddened to hear of Keith’s passing and myself and Lyn McNammara who also worked with Keith have been recalling some of his amazing pranks and colorful life style which at time bordered on shall we say the somewhat bizarre. I vividly recall employing Keith in November 1965 as an announcer and newsreader at NRN. Our News Editor John Sheppard and I were enormously impressed by the mature voice of this 20 year old announcer from 2RE Taree. His appearance on camera was very authoritative. I seem to recall he told me he was connected to the famous Ashton Family of Ashton's Circus fame. Show business must have been in the blood! He was only with us for a short time and I'm not surprised that he went on to bigger and better things in his career. I very was sad to read of Keith's passing this month. I have just learnt today of the passing of my friend Keith Ashton. My name is John Wright, and I am the secretary of the Australian Radio DX Club. I got involved with Keith when he had 2AM at Caringbah, and also involved with the Matilda search engine. A terrific person, a DXer, interested in how far the 2AM 1620 signals could be heard! Well around the world Keith! I still have letters and reception reports which the club use to reply to those listeners who wanted the old audience card known as a QSL card. Only in the past couple of months did he suggested getting a shortwave transmitter on the lower bands. The friends that he made within our club, will be saddened by his passing. Keith any myself shared also a nemesis, diabetes. He was a great and knowledgeable man. Sadly missed by his mate Johno. It was with great sadness to hear the radio world had lost its greatest mentor. I worked with Keith in my very early days at Radio Waikato in Hamilton New Zealand, I had been recruited from hospital radio at Waikato Hospital to mid-dawn Radio Waikato. Keith at the time was the "Breakfast Jock" he would arrive at five to six for a six o clock start, throw me the Auckland Herald saying adlib until I get back, and then he would go to have a coffee. On coming back to the studio he would the give me a valued outline of my performance. Sometimes the words he used were not to be broadcast but to this day and forever I never found a better trainer or broadcaster. My love for radio was started by Keith and I have always held him as the ultimate example of what Radio is all about. Thank you Keith for what you did for me you helped make my life worth while. The best advice he ever gave me was "let the music do the talking". My name is Garry and I am from Maitland, I first met Keith in Brisbane in 1977, I was shocked when I heard that Keith had passed away and I would like to say what a great loss to many walks of life. The circumstances in which I met Keith under were not pretty to say the least, but the true spirit and person that Keith was helped me and many others in Brisbane at that time , I believe some good results and some not so good, but Keith never gave in. . He will be missed by all I am sure. I owe a lot of what I have now to Keith as if he wasn’t around for me to meet in the 70’ with his guidance and understanding I am sure I would have ended up in a bad spot today, more than likely dead. , but instead I have a lovely wife, 4 children & 2 grandchildren. To you my dear friend Keith. You rev ‘em up, mate. They will follow. I met Keith Ashton and Murray the I, when they worked at 7HO, and I was at 7HT Hobart in 1969. He was a character alright, and he had the most amazing stories to tell. I remember him talking about Ashton’s Circus. I was 21 and we all were young, and had dreams of making it big in Radio and TV. It was a pleasure to know him. 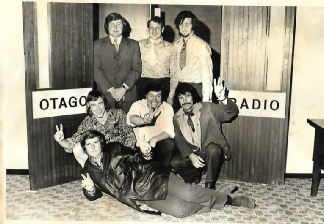 I used to be an announcer on many New Zealand stations in the 80's mainly 4XD, 4XO, 3XG, 1XX, 3XA, 4XA, 4XF. They were the callsigns but known as Radio Dunedin, Radio Otago, Radio Rhema, Radio Bay of Plenty, Radio Central and Foveaux Radio. I had the brief pleasure of meeting up with a person whose was an inspiration to me in my broadcasting years, Keith Ashton. I met him in Brisbane after he had a stint on Voice of Peace, he worked at 4BH then met him at a pub in Brisbane as he was setting up a short term licence in Brisbane in a Mall. Will never forget Keith, wish he was still with us today, what an exciting life he lived. Miss him.